What do you do when you order a gift and it doesn't get there in time?! 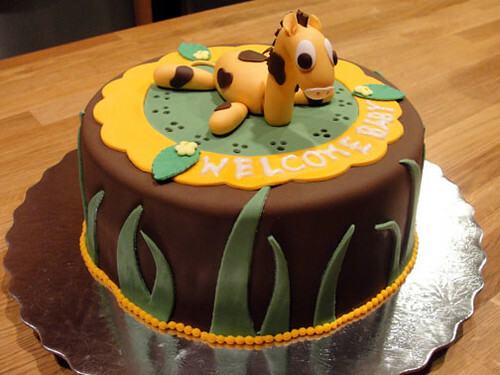 You order a cake! That is exactly what Annie did for her fiance for his birthday. 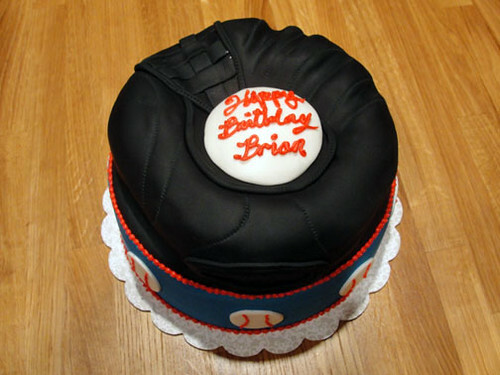 She custom ordered a baseball mitt for Brian, but it wouldn't be delivered in time for his small family gathering. After discussing ideas with Annie, we decided on a 8" round cake topped off with a dimensional mitt that wouldn't be short of details. 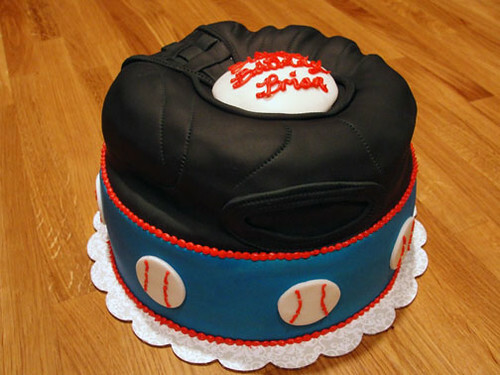 The cake started with an image of the closed-web mitt, and a moist red velvet cake. 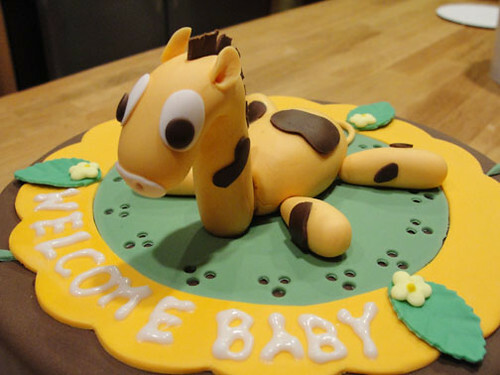 The bottom cake was a 3" tall round, torted and filled with cream cheese filling. The mitt layer of the cake was carved out of a 2" layer of red velvet. I took a picture of the ordered mitt and sized it proportionally to the diameter of the cake and printed a template that I used to carve the cake. 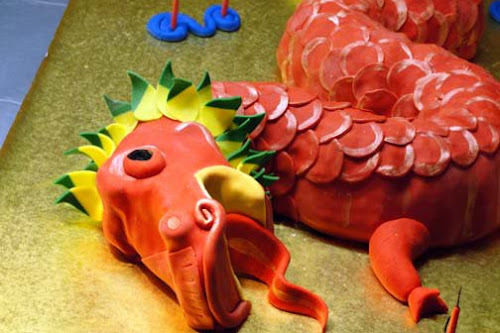 I exaggerated some of the cuts to ensure that they wouldn't be lost once covered with fondant. I then smoothed on a thin layer of cream cheese flavored buttercream over the entire cake. The top portion of the cake received a smooth blanket of black fondant, and the bottom was covered with a wide strip of bright blue. Using a quilting wheel, leather stitches were imprinted to create a realistic sewing pattern. To create the closed-web look of the mitt, I weaved strips of black fondant together and then trimmed to the proper shape and size. A mitt can't be complete with out the ball! I used this area to pipe out a message to the birthday boy. To finish off the cake, baseballs were cut out of white fondant and the red accents were piped on with buttercream. Time to play ball!. . . 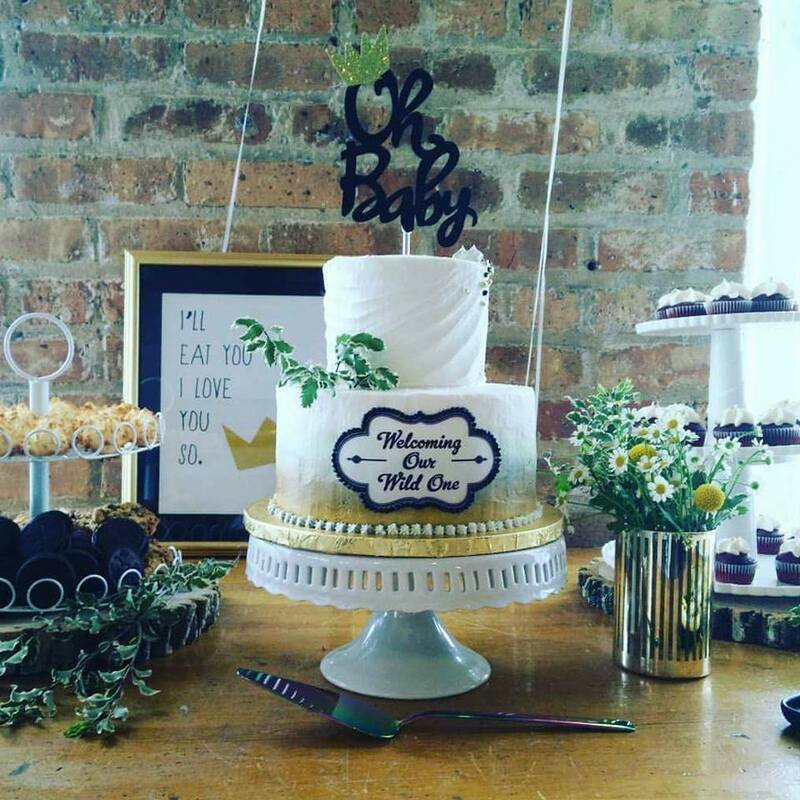 I mean eat cake!